Synopsis: A boy growing up in Dublin during the 1980s escapes his strained family life by starting a band and moving to London. Writer/director John Carney seems to have found his niche in the film industry by making enjoyable movies about musicians making music. Several years back he made a splash with his indie hit Once, and he parlayed that success a few years ago by rehashing a similar story into the Keira Knightley/Mark Ruffalo vehicle Begin Again. Well, Carney is at it again with his newest musical dramedy, Sing Street. Set in Dublin, Ireland, in the year 1985, Sing Street is about a young man named Conor (Ferdia Walsh-Peelo) who is forced to transfer from his posh private academy to the Synge Street Christian Brothers School when his family falls upon hard times. He has trouble fitting in, but sees a bright spot to the situation in the form of a beautiful girl named Raphina (Lucy Boyton) who lives across the street from the school. He approaches her and learns that she is an aspiring model, and asks her to be in a video for his band. She agrees, and Conor is faced with a different problem; he doesn’t have a band. He makes friends with a guitarist named Eamon (Mark McKenna), and together they write songs and form a band which they call Sing Street, cleverly named after their school. As the band grows, so does Conor’s relationship with Raphina, and the star-crossed kids soon decide that his music career and her modeling career would be better served if they ran away to London. 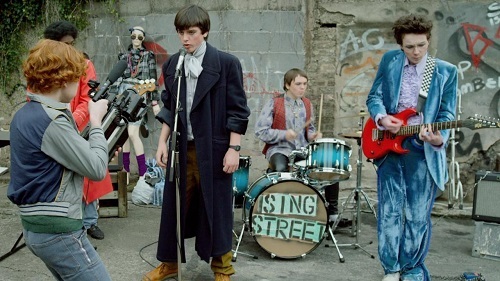 For those familiar with John Carney’s resume, Sing Street is the perfect combination of Once and Begin Again; it’s got the lo-fi appeal and indie vibe of Once, yet still retains the whimsy and wonder of Begin Again. A big plus is Carney’s decision to use unknown and novice actors in the main roles – although Conor’s family is played by seasoned vets (father by Aidan Gillen from “Game of Thrones,” mother by Maria Doyle Kennedy from “Orphan Black,” and encouraging older brother by Jack Reynor from What Richard Did), most of the kids, including all of the band members, were found through open auditions held by Carney in Ireland. The fresh faces make the kids that much more relatable to the audience. The kids are like the inseparable schoolmates that the viewer never had, especially in the case of Mark McKenna, who plays Conor’s musical partner, Eamon – at one point, Conor shows up at Eamon’s door and asks if he wants to write a new song, to which Eamon replies “always.” Who wouldn’t want a best friend like that? Thematically, Sing Street is about growing up and finding an identity, and it presents those themes in the most charming way possible. Every week, the band imitates the look of whichever artist happened to appear on “Top of the Pops,” so the gang goes through phases of dressing like Duran Duran, The Cure, and Spandau Ballet. Of course, that’s when they aren’t naïvely wearing Halloween costumes in their videos that mix cowboy outfits with vampire fangs. Oh, yeah, and the girl. Conor’s relationship with Raphina is another aspect of the film that can only be described as “cute.” Everything about the movie clicks in a way that makes it difficult to not enjoy. 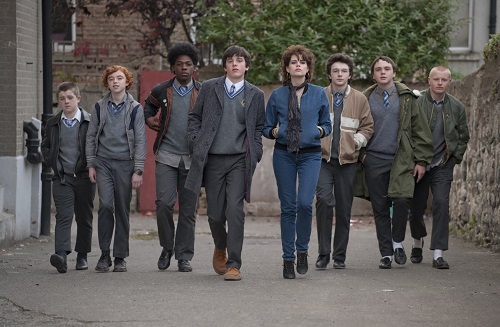 With Sing Street, it appears as if John Carney has done it again, and has done it better. It’s a little more autobiographical than his previous films, but that just makes it more personal, and more endearing. It still follows Carney’s standard formula, but until he makes a bad movie, there’s nothing wrong with that. The formula hasn’t let him down yet. Sing Street was shot on location in and around Dublin, Ireland, by cinematographer Yaron Orbach (The Ward, Our Idiot Brother). Orbach’s photographic approach to the film is stripped down and economical, giving the production a street-level, guerilla filmmaking style full of camera motion and fly-on-the-wall observation. For the band’s music videos, Orbach uses eighties-era technology and slyly makes each video looks better than the last, subliminally making it appear that the band is getting better at what they are doing. By the time Conor’s dream-sequence video for the band’s big “hit” song, a jumpy number called “Drive It Like You Stole It,” is shown, it’s a full-blown MTV style production, with cranes, lighting rigs, and backup dancers. It’s easy to overlook the cinematography in an understated movie like Sing Street, but Orbach’s camera does as much to tell the story as Carney’s script does at times, and for that, the director of photography deserves credit. 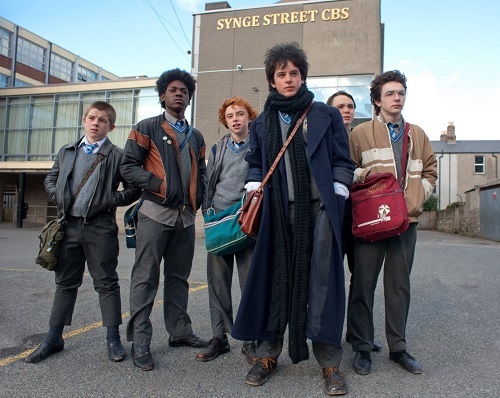 Like John Carney’s other movies, Sing Street relies heavily on its musical soundtrack. Of course, the film is filled with eighties gems like Duran Duran’s “Rio,” The Cure’s “Inbetween Days,” and The Jam’s “Town Called Malice” – there’s even a cool piano arrangement of A-Ha’s “Take On Me” – that, while a bit safe and predictable, are great at illustrating the different phases that Conor and his bandmates go through in their quest for musical fulfillment. But the real strength of the soundtrack is in the original Sing Street songs. The band’s tunes were written by Carney and Gary Clark, the main songwriter for the eighties Irish pop band Danny Wilson, and they convincingly sound like songs from the era. If there’s a knock against the original music in Sing Street, it’s that the production is a little too modern – it sounds more like Bruno Mars was twisting the knobs in the studio instead of David Kershenbaum. But, if the only beef with the music is that it sounds too slick, the movie is doing something very right, and it’s hard to believe that anyone would be able to walk out of a screening of Sing Street without “Drive It Like You Stole It” stuck in their head.